…a treasure trove of privilege. There used to be two mills on the river that ringed the garden. Known as ‘l’y deux molins’ [the two mills] in the local dialect, the site was gradually named the “Moulin hideux”. The excellence and passion of 4 generations in an exceptional place. The atmosphere here is magical. 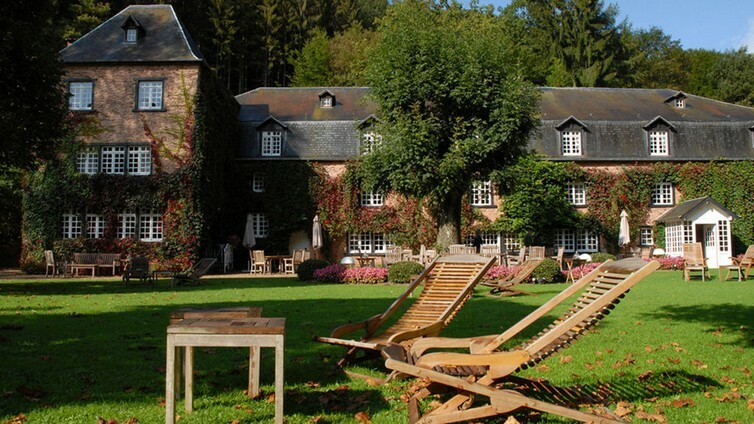 It charmed Raymond Henrion in 1945, who bought the mill and turned it into an inn. Charles Lahire, his young cousin, and a scion of a family of hoteliers from La Roche, joined him a few years later. Together, and with the help of their respective wives, they built up the prestige of the establishment. 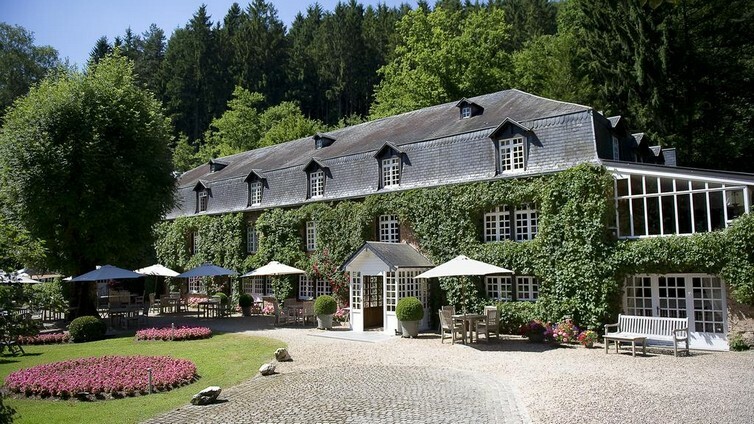 Relais & Chateaux, starred in the Michelin Guide since 1960. 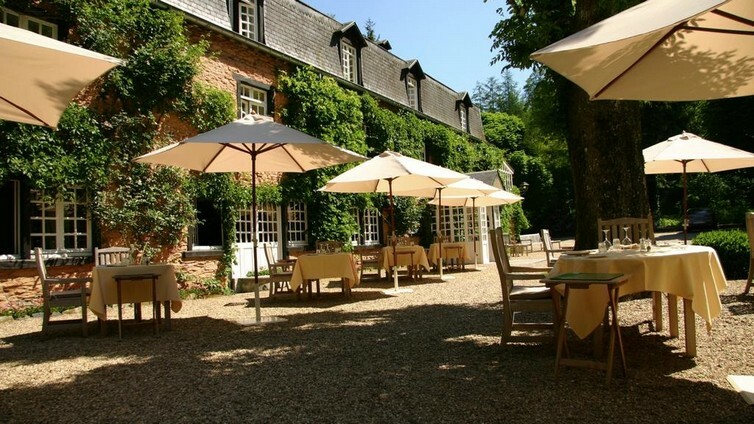 In 1960, the Moulin Hideux joined the chain of Relais de Campagne (former name of Relais & Châteaux), becoming the first establishment outside France to be part of this prestigious alliance. On that date also, the restaurant of the Moulin Hideux was awarded a star in the Michelin guide which it has retained down to the present day. In 1967, Charles Lahire married Martine, whose family owns the R&C Château de Fère-en-Taredenois in Champagne. Together they took over the reins of the Moulin Hideux. They have three children: Sophie, Catherine and Julien. A young chef at the Mill. Julien, Chef at the Mill since 2008, today runs the establishment. The 4th generation took over the helm and charm still sets the tone at the Moulin Hideux. Julien Lahire is at the helm of the Moulin Hideux. Inspired by the beauty of the premises, and keen on perfection, he has brought his personality to the traditions of the establishment. 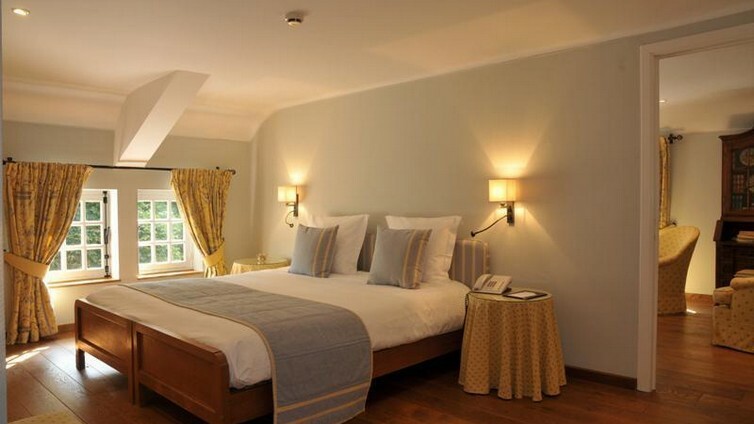 He will welcome you with elegance, intent on having you enjoy a pampered stay in his world. At the Moulin Hideux, luxury and sustainable development complement and support each other. Without compromising the quality of comfort for its guests at any time, our hotel has gradually introduced an ecological dimension in its entire organisation. From the heating system, to the layout of the garden, the decorative elements, and the kitchen, we use ecological products stemming from the region. This requires several steps and meetings with local craftsmen and producers. It takes a constant effort, but the project is enthralling and the results obtained astounding. The traditional fuel-oil fired heating system was replaced in 2012 by woodchip-fired boilers – a real revolution for the Moulin Hideux. We have reforested the bottom of the valley and the banks of brooks. Lobed-leaved trees have replaced resiniferous trees. Well spaced, they have allowed the undergrowth to flourish thereby enhancing the biodiversity of the estate. The beehive and birdhouses are the natural allies of the luxuriant kitchen garden. Today, the Moulin Hideux continues its efforts and wants to give an example on the matter. 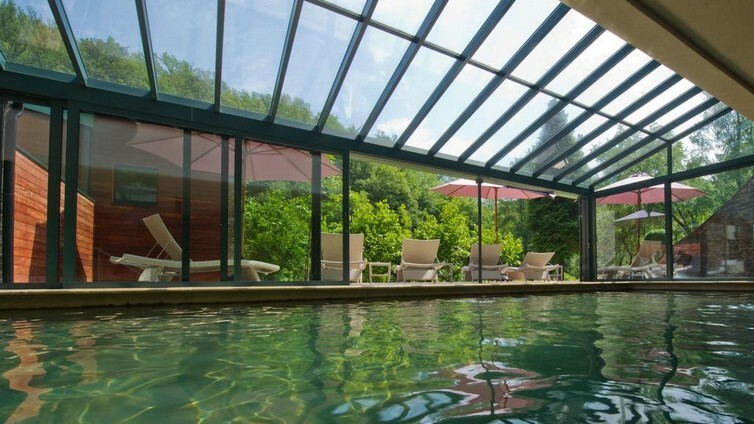 The Moulin Hideux has an indoor, heated swimming pool, flanked by an outdoor solarium that opens to the garden and is protected from prying eyes. A hammam and an infra-red sauna are also at the disposal of guests. We provide a series of care treatments and massages. By reservation only. A tennis court and a space allocated for playing boules are available in the garden. Moments of quiet, velvety relaxation. The lounges will beckon you invitingly to gather with pleasure around a low table, to read or enjoy a drink, with soft background music. An elegant, comfortable and well lit smoking lounge awaits lovers of flavourful cigars. 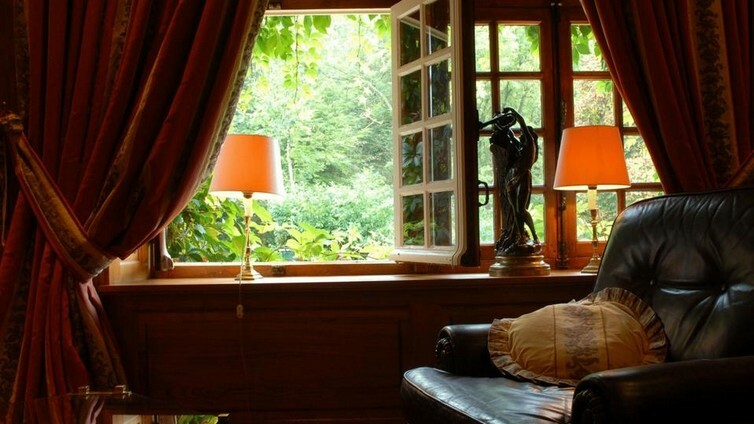 The ambiance is relaxed and conducive to private discussions and chats. Wifi only in the lounge. The garden is a soothing place -- nothing to disturb the calm, other than the birdsongs. It is laid out in several spaces from a fine terrace. The most delicate flowers seem to grow naturally. The scope and organisation enable everyone to reconnect with nature. The Moulin Hideux is an ideal starting point to discover a rich, well-preserved heritage. Hikers can take sign-posted paths which lead from river sheds to splendid vistas. Lovers of history and culture will head for Bouillon or other historical cities to be discovered on the borders: Orval, Avioth, Charleville-Mézieres, Luxembourg. Chef-owner Julien Lahire looks for the best quality and goes to meet the producers with whom he works. He gives priority to local products. His cuisine is sincere, natural and intense. The most tasty dishes appear in simplicity. Flavour in cooking is an art. Julien Lahire and his team devote all their energy to it. Game, the speciality of the house, is on the menu throughout the season. 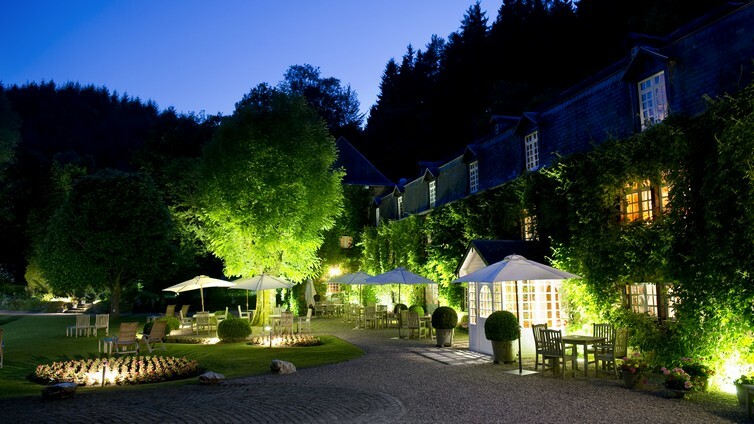 Thank you for choosing to book Auberge Du Moulin Hideux.! Due to limited availability you are encouraged to contact the reservations department to enjoy our personalized service, by phone on +32(0)61 46 70 15. Please fill this form for individuals or for groups and you shall receive an answer written by a live person at Auberge Du Moulin Hideux. This is the only way you can know exactly what room types are available for the dates you want, and the best possible rate, because you are dealing directly with the hotel. Bear in mind that websites set up to give an automatic answer, work with allocated quotas given by the hotel, therefore when it appears there are no rooms available for the date you want, this is not necessarily true, because they never allocate ALL the rooms to third parties. From Brussels or Luxembourg, E 411 exit n° 25 towards Bouillon; from Paris, A 4 Reims - Charleville-Mézières towards Liège. Luxembourg Findel (Intl) - 95 km.